How often have we learned that Hawaii is different from mainland? Pick up something that works there and plop it down here? Why would we do that when bikeshare systems on the mainland are consistently unprofitable and rely upon ongoing taxpayer support? We decided to put more time and study into this subject when determining the pricing for Biki, the bikeshare system being introduced in Honolulu by Bikeshare Hawaii. Pricing was not determined hastily, based only upon student-managed focus groups that were conducted in 2015 or a 2014 feasibility study that became dated as the bikeshare industry quickly evolved. Lori McCarney goes riding. A new bike-sharing program will be launched in Honolulu this week, with 1,000 bikes in 100 stations expected to be up and running. Over a year-long period, we talked to many bikeshare organizations, operators and cities on the mainland. We joined the North American Bikeshare Association to learn best practices and to better understand what was happening in this very young industry. Most people don’t want to commit to a relatively large purchase when they don’t know how they’ll use bikeshare. All of the time, or hardly ever? If people want to use bikeshare just periodically, an annual plan is overly expensive and inflexible. Members must pay for periods of the year when they don’t ride — like winters. A $150 annual plan that you only use for nine months would equate to an effective cost of $200 per year. How often would you ride a bike in sleet or snow? We also learned that prices for casual users, with confusing fares and escalating overtime penalties, were the money makers. Confused users subsidize savvy “dock surfers” who link together rides from station to station always remaining under the 30-minute time limit. During our period of study that went well into 2016, we also began to see most systems revamping their pricing to try to find a means to gain riders and cover their costs. Annual plans were a money loser, but these other systems were stuck with them. New ideas, like walk-up fares and monthly plans began to emerge and we learned that these new programs were helping to increase ridership and the viability of bikeshare systems across the country. Our nonprofit organization is tasked with being financially self-sustaining. We received a grant from the city and state totaling $2 million that cannot be used to purchase equipment. This grant has supported our planning, outreach, start up, launch and early operating expenses, and has not yet been fully utilized. We wanted to attract a broad range of users to help more people understand the benefit of biking for short trips instead of driving. We didn’t want to depend upon fees created by confusion and penalties to cover those who use it for pennies a ride. So, we focused on creating a pricing structure that would fit the needs of potential customers rather than simply copying what other bikeshare systems had been doing. people who will use it consistently in a set pattern to get to and from work, school, etc. people who will use it periodically, when they think it’s their best transportation option. people who will use it infrequently, when they have a rare need — late to a meeting, opportunity to join friends somewhere, etc. Residents fall into all of these categories while visitors likely would only be in two (although longer-term seasonal visitors may fit in all three). Monthly Plans: For those who ride it consistently, we created two plans: one for $15 for a month (30 minutes) and one for $25 (60 minutes). These are closest to an annual plan, but there is no commitment to buy 12 months. You can buy a month at a time so you can fit it into your monthly budget and not pay for the months you won’t use it. And have you ever multiplied your rent, your car payment or your cell phone bill by 12 months? I don’t think you’ll want to! Free Spirit Pass: A totally new pricing concept — the Free Spirit Pass — was developed for people who would like to use bikeshare just when they need it. This plan is the first of its kind in the country. You pre-purchase minutes that never expire and use them as you see fit — short rides, long rides, months between rides. Twenty dollars buys you 300 minutes; so a 10-minute ride from downtown to Kakaako would cost about 67 cents. Single Ride: We learned from the mainland that many folks really don’t want a plan. They just want to walk right up to a bikeshare station and check out a bike. Maybe they do it only once or twice a year. It costs just $3.50 for a ride of up to 30 minutes, our Single Ride price. To confirm our thinking, we hired a highly reputable, local research company to test the pricing structure among residents and visitors via a quantitative and projectable research study. It confirmed that our plans could work. So, we moved ahead. But what about people with low incomes who can’t afford any of our price plans? We developed our technology to be able to handle a variety of price configurations specifically so we can work together with public or private organizations to develop plans for those who cannot afford the fares. We actively seek grants and partnerships to do so. We believe our pricing structure is well-considered and affordable to a vast majority of people and suits residents and visitors of Honolulu. Along with donations from supportive organizations and individuals, we have the opportunity to be financially self-sustaining and perhaps even generate “profits” that will be reinvested to improve the usefulness of the system to our community in the years to come. Editor’s note: Lori McCarney’s Community Voice is a response to a Community Voice by Wyatt Gordon, Honolulu Residents Get Raw Deal With Bikeshare. Bikeshare Hawaii is currently supported by Ulupono Initiative, which is funded by Pierre Omidyar, the publisher of Honolulu Civil Beat. 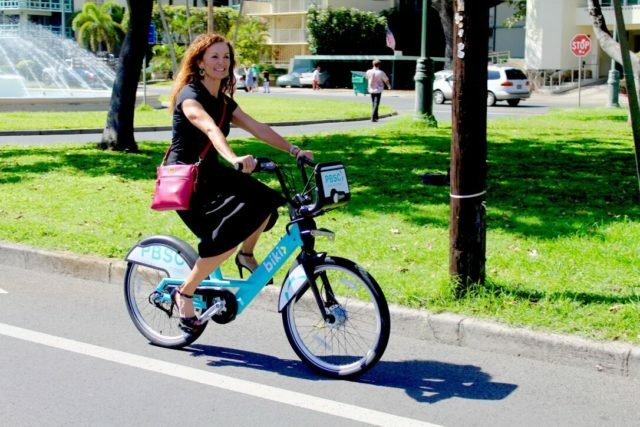 Lori McCarney is CEO of Bikeshare Hawaii. She has 40 years of experience in senior management and has held executive positions in local, national and international markets.